What happens when a cat sneaks over and pees all over the precious manuscript that you've spent months of your life inscribing? 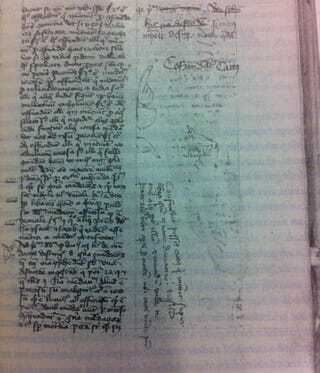 If you're this 15th century monk, you leave a note cursing the cat and move on with your writing. The scribe turned the page and kept on writing, but I wonder if, as he smelled that lingering odor of cat pee in the days ahead, he felt compelled to write more curses upon the head of that kitty. Image credit: Cologne, Historisches Archiv, G.B. quarto, 249, fol. 68r.